Creating an online community/Support center is one great branding method most Companies are missing when it comes to customers’ satisfaction. It helps create trust between the two parties, and makes the the customer feel save while using your product as they can always run back to the community when they need help. I Think Tecno company saw the importance of this, and today we have Tecno Spot – The Community for Tecno Users. The name which was coined based on customer’s feedback done through a poll on Twitter shows that the guys at Tecno really care about their customers opinion which is a plus. Tecno Spot is a community where you can can share your ideas and discuss interesting topics with other people with similar interests. 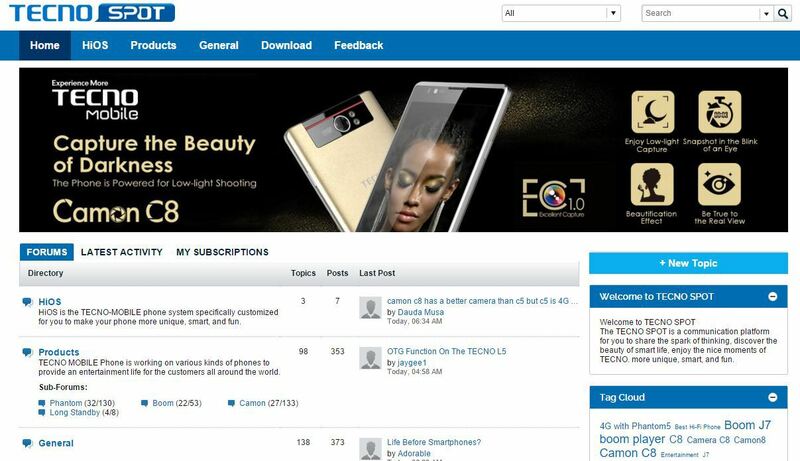 Not only that, it serves as an information hub for all TECNO enquiries. Carl Care Representative will be available to troubleshoot/solve tech issues. Users and techies are encourage to solve each other’s problem and share tutorials and technical how-tos to help them through. Besides, users of the platform can even help one another in resolving issues and offering advice. HiOS: HiOS is tecno customized User Interfaced (UI) just like other Emotion UI for Huawei and Vibe UI for Lenovo. Questions and Answers concerning the HiOS woud be attended to in this section. Products: Everything on all Tecno products would be displayed here and also you can share your experience on a particular product. Tecno has made it easy to navigation through this section by adding sub-forum like Phantom, Camon, Boom and other future release. Other Sections include: General, Downloads, and Feedbacks. Tecno Spot is supported in just few countries which are: Nigeria, Kenya, Ethiopia, Tanzania and Egypt. Registration is very simple and easy.All You have to do,is to go to the official site by clicking => Here, then use any of your social media accounts to either sign up as a first timer or login as a user.